Ellingham Academy, an elite private high school for smart teens, sits in remote Vermont hills. Founded by one of the wealthiest men in America in the 1930s, its creation coincided with the tragic kidnapping and murder of the founder’s wife (and the disappearance of his daughter). 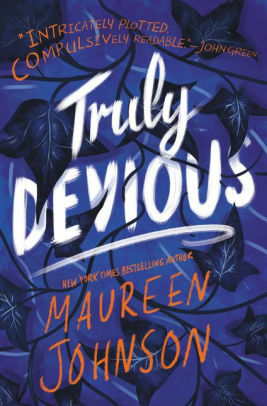 The only major clue was a threatening letter received beforehand signed by “Truly Devious.” The crime was never solved. Eighty years later, Stevie comes to Ellingham Academy. While it is her intelligence that has gotten her in the door, it is her love of true crime and her desire to solve the mystery that has been unsolved for so long that makes her decide to come. But before Stevie can get too far in her work, a fresh murder rocks the school – and the method bears a resemblance to the earlier crime. Has Truly Devious returned? The first of a trilogy, the novel ends on a cliffhanger that will entice you to get the next one. However, the book doesn’t hold up as a story in itself. Rather, it is an introduction to a story that promises to be intricate and exciting. In other words, put this one on your hold shelf and wait to read it until the other two installments come out. This is a serial, not a true trilogy. The story is fascinating and the facts of the earlier crime are probably the best of the book (although some promising twists at the end suggest that that is about to change). There’s not much depth to the characters but Stevie makes a good detective and fills all the roles you want in such a character: sharp, brave, and risk-taking. That she’s a bit green and makes lots of mistakes makes her a promising heroine and we can look forward to what happens next.